Sushi is one of Japan’s most famous dishes. This is served not only in Japan but as well as in other Japanese restaurants around the world. But when you’re in the land of the rising sun, a dining place you should experience is the conveyor belt sushi restaurant. 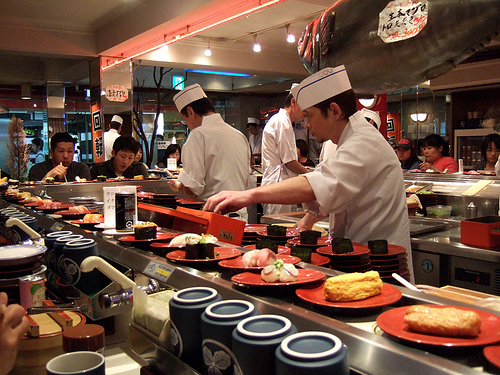 This type of restaurant is also referred as a sushi train or kaiten-zushi in Japanese. As its name suggests, conveyor belt sushi restaurants are eateries where dishes are served using a conveyor belt floating past your seat. In short, no waiter serves your food so you have to serve yourself by simply picking the dish you like that passes by. Sushis offered here are the quality yet affordable ones. If you would like to enjoy fresh cuts, the best time to go to this kind of restaurant is when it’s busy. When many diners are in the place, it only means a quick turnover of sushi on the conveyor belt. Do take note that you can actually order food you like in a conveyor belt eatery. It does not follow that food you don’t see being served on the belt is not available. So go ahead and flag a chef to request for your favorite food or use the computerized ordering screen being used in some restaurants. Also, this place serves other dishes apart from the usual sushi. You can order any food you like whether it’s deep fried such as the tempura, steamed or broiled. And don’t forget to use the pickled ginger. The role of the ginger is to cleanse your palate between dishes and not really as a garnish. It lets you savor your sushi better and ensures the flavors don’t clash in your mouth. Another important tip when dining at conveyor belt sushi restaurants is to be mindful of your plates. A good etiquette is to stack up your plates according to type once you’re done eating. Some chains charge a fix price for all plates while the others have different pricing depending on the type of plate you use. There are also restaurants that use plates with computerized chips readable via a handheld scanner. Restaurant owner Yoshiaki Shiraishi pioneered the kaiten-zushi in his own dining space. He invented the technology after having difficulty managing his restaurant’s operations with only a few staff available. His main goal then was to serve more customers faster while still offering affordable food. The conveyor belt in an Ashai brewery became his inspiration after watching how beer bottles moved on a belt. It took five years for Shiraishi to develop his first conveyor belt machine. Called Mawaru Genroku Sushi, the belt was launched in 1958 in Osaka.